BetOnline have been serving United States players since 2004. They are currently the only U.S. betting company to offer a full mobile racebook. 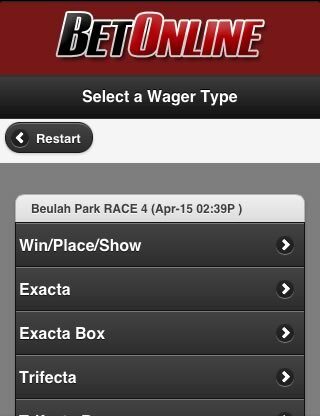 Place bets at any U.S. racetracks from your phone. Bitcoin friendly. Mobile site that is compatible with iPhone, Android, Blackberry, Windows. Highly respected United States facing online and mobile sportsbook. 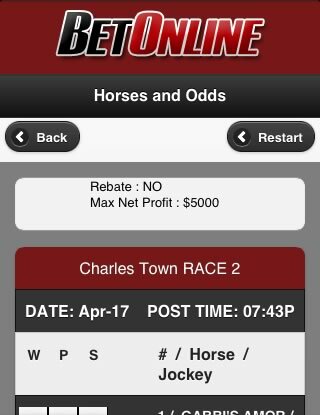 ONLY mobile racebook for U.S. horse race bettors. All U.S. racetracks. New mobile users get $50 free play when they place a mobile wager. Bitcoin friendly bookmaker. Process withdrawals and payouts with bitcoin. Betonline offers online betting and gaming services to an international customer base on a range of sporting events and gaming options. U.S. managed but operating out of Panama City (due to U.S gaming rules), the site has an emphasis on American markets and has been in operation since 2004. It is rated amongst the top 50 online sportsbook, racebook and betting exchanges by overall traffic received and the mobile site can be accessed free of charge via smartphones (iPhone, BlackBerry or any other internet browser-enabled mobile phone). 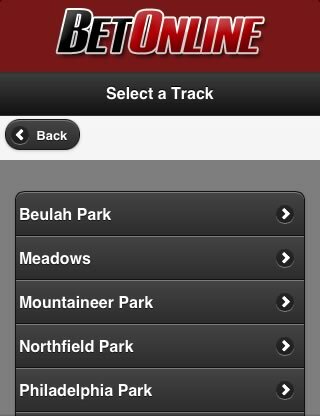 Betonline mobile provides quick and direct access to sports betting on the move. 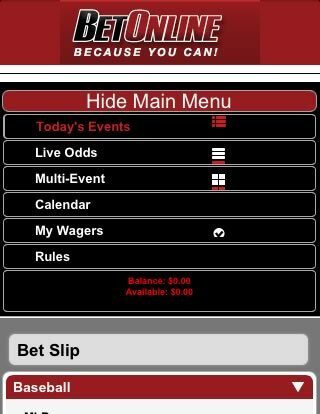 The main feature available to BetOnline mobile users is in-play betting on live sporting events. A healthy array of live betting options is provided on events from around the globe so you can place a bet on just about anything from anywhere. 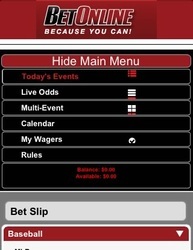 The sportsbook app offers a range of wagering types, such as straight bets, parlays, teasers, props and futures. Once you've selected your preferred betting type, you are then provided with the full list of betting markets available on the main site. It should also be noted that BetOnline are currently the only mobile sportsbook to also offers their customers the ability to bet on every horse race in the United States from their phone. 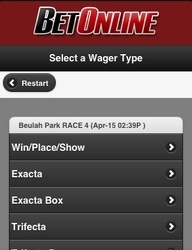 Once inside the mobile racebook, punters are offered the choice of Win/Place/Bet, Exacta and Trifecta betting options. Ok, so the site is not the sexiest that you will come across; the colour scheme and font are very much ‘no nonsense’ and will not win any design awards. But let’s face it, you’re not really accessing the site on the move in order to appreciate the fancy design are you? Focusing purely on betting, the mobile site is user friendly and navigation is straightforward. Available sports markets are simply laid out and live betting options from around the globe are easily accessed. Customers are required to login to their account before proceeding to the mobile site. 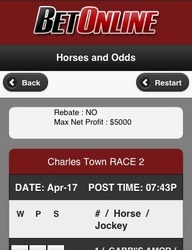 Specific to mobile users, currently on offer is a mobile betting $50 free play. Receive up to a $50.00 free play bet on your first ever mobile sports bet. Simply place a sports bet from your smartphone or tablet and if your bet loses it will be reimbursed up to a $50.00 free play. Reimbursement is again obtained by sending an email identifying your losing bet from your first mobile wager and the free play bet will be credited to your account within 48 hours. 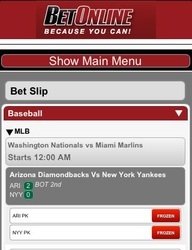 A $25 free bet is also currently offered on the first live bet placed in play. Customers bet with their own money and in the event that the bet loses the amount will be refunded to the player’s account within 48 hours of email notification being sent to Betonline that the bet was not a winner. 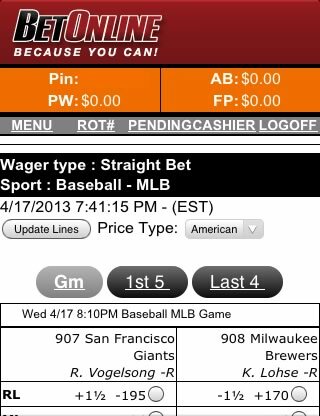 Although slightly cumbersome, this is a solid incentive to take that first live bet. A potentially lucrative promotion offered by Betonline comes in the form of a ‘Lifetime Bonus Guarantee’. Although slightly complicated, customers can earn up to a 25% free play bonus on every qualifying deposit. Terms and conditions apply but, generally, to qualify a deposit must be a minimum of $50 and there is a six times rollover requirement. Reading the small print on this one is important, but to committed punters this may prove to be a valuable offer in the longer term. Markets available for punters have an international and North American slant, but sporting events from around the globe are well covered, both in advance and in-play. Naturally, therefore, National League Basketball and Baseball feature heavily, as of course does the N.F.L. Spread betting on markets is offered extensively and in this sense provides a slightly different emphasis to many European online betting sites that favour outright predictions and correct score betting. Horse racing is extensive, particularly in coverage of the plethora of U.S races available. A general tips section also provides very general but helpful advice to the new or casual racing punter, along with other information on various aspects of the race world. Betonline offers a number of promotions and price promises on their sportsbook. 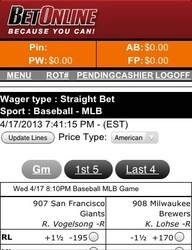 Betonline boasts that it offers the best online odds on all Major League Baseball games. In addition, a ‘nil-nil’ refund is currently promised to all customers betting on soccer matches where the result ends in a goal-less draw after 90 minutes. To qualify, customers must have bet on there being at least 2 ½ goals in the match and the refund comes in the form of a free play bonus up to the value of $250. Other terms and conditions do apply and promises and offers regularly change so be sure to read these on the site before betting so as to avoid any disappointment. Contact about any account or betting issues can be made in a variety of ways. Live email chat with a customer service representative is a helpful first point of call, particularly for those betting via the web on the move. Calls can also be made both inside and outside the U.S and email contact is also available for less urgent enquiries. With extensive coverage of U.S. sports and a bias towards spread betting, Betonline mobile is a no nonsense site for north American punters and those with a particular interest in American markets. Although not the slickest of online gaming sites and not the most innovative when it is comes to features, for those with a particular interest in all things U.S. and beyond this site will do the trick.